At four cafes in Boulder, customers can check out a reusable stainless steel mug and return it to other participating cafes or drop-off kiosks set up by upstart Vessel Works, according to Fast Company. Vessel won’t charge cafes a participation fee, and will sell them the mugs at a lower average cost than disposable paper cups. Customers must use a mobile app to check out a mug for free, but the app will charge them if they don't return it within five days. Vessel will send both customers and cafe clients reports on their waste-saving progress. The app can also track where the mugs are, just like city bike-share programs. This mug-share program doesn't financially incentivize customers to download its app, but the fact that they can use the sustainable cup for free may enough of a lure. Today's consumers are willing to pay more for sustainable packaging, and increasingly seek out mission-based, eco-friendly brands. Programs like this could also be the nudge consumers need to actually put their sustainable ideals into practice. Starbucks, for example,has long supported a bring-your-own cup policy by offering a 10-cent discount, but less than 2% of customers take advantage of it. Many independent coffee shops offer discounts, too, but many consumers seem disinterested or forget to bring their own. A recycling advocacy group in Oregon estimates that Portlanders alone plow through 50 million disposable coffee cups each year. Starbucks also recently pledged $10 million to the cause of creating a more sustainable system, but it focuses on building compostable cups rather than encouraging customers to bring their own mugs. Embracing reusable mugs could be a way to differentiate from competitors and brighten brand halos, but it's unclear if this system would work for major chains, which spend very little on paper cups. Vessel's market predecessor, Good to Go — a reusable mug program launched in 2014 — fizzled out after working with a few cafes in Brooklyn and Manhattan. 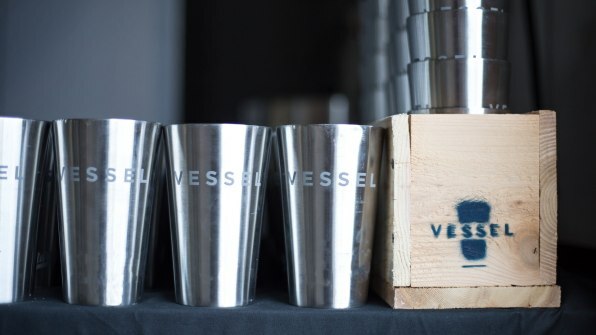 Vessel could suffer the same fate if it doesn't land a partnership with a highly-visible coffee chain. Still, there have been similar programs that have seen success. In Freiburg, a German university town near the borders of France and Switzerland, a cafe started a reusable mug-share system that has so far been successful. The local government — which estimates that the city’s coffee drinkers toss 12 million disposable cups every year — actually provided independent cafes with “Freiburg Cups” and asked customers to pay a small deposit to use them, which they recoup after returning them. Hamburg also has a blossoming program called Refill It!, started by a local cafe. But Freiburg is about the size of Cincinnati, and Germany already has a robust recycling system in which consumers buy plastic crates of 12 bottles (as they do for beer) and return the empties, in the crate, to the store. The grab-drop-repeat method seems to be the disrupting factor on which startups like Vessel are counting, since the biggest obstacle to reusable cup use appears to be consumer propensity to forget their mugs at home and their frustration at having to lug them around all day. Still, a growing number of consumers have embraced keeping a reusable water bottle on their person, so it's possible that with the right branding and partnerships, mug programs could take off.